I’m in the final stages of edits for my next book, the one on prayer book spirituality. 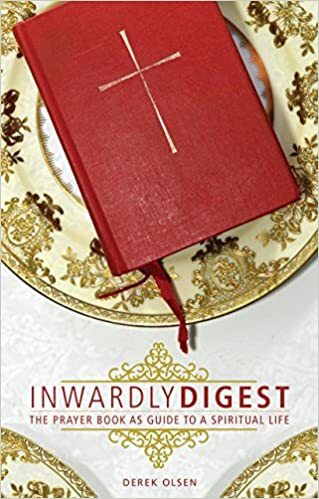 It finally has a title: Inwardly Digest: The Prayer Book as Guide to a Spiritual Life. As I went through the section on the Calendar yesterday morning, I realized that while I’d talked about the hymns in some seasons, I’d left others out. So–I spent some time with the hymnal, and put together some thoughts on those. In going through that exercise, I was reminded just how much the early hymns of the West, those by Ambrose, Gregory, Venantius Fortunatus, Caelius Sedulius, and the the early anonymous compositions connect Scripture, liturgy, and doctrinal themes into a seamless sonic package. When I think and write about the ways that liturgy provides interpretive lenses for both Scripture and Christian experience, I think these hymns play a particularly important role in not just making some foundational connections but handing them down and keeping them alive. This entry was posted in Chant, Daily Office, Patristics on March 9, 2016 by Derek A. Olsen. I just ran across a fascinating post which has actually been out there for a while, now. It’s a discussion by Adam Wood, part of the Chant Renaissance in the Roman Catholic online world, about what it would mean to truly offer sacred music on an Open Source model. It gives me quite a lot of things to think about, but the bottom line squares quite well with the proposal that I put before our Standing Commission on Liturgy and Music: our music and liturgy need to be freely available without cost in ways that developers can leverage in order to produce ways of accessing and using them either freely or at a cost. This entry was posted in Chant, Roman Catholic, Tech on May 17, 2013 by Derek A. Olsen. If you have any interest at all in Gregorian chant, then you must MUST visit this site: Gregorian chant books for the Roman Catholic liturgy. It’s the best source that I’ve seen anywhere that pulls together not only the massive corpus of chant materials but links to where such things can be found on the web. In terms of medieval material, the editor only skims the top, pointing out the key manuscripts of the San Gall library and does not connect to the many other chant manuscripts in many other digitized collections around the web, but this does not at all diminish the vast volume of work that has gone into this. They say that to the man who has a hammer the whole world looks like a nail. I’m more than guilty of this myself, but—as a database guy—I can’t help thinking that supplementing this long tabular format with a basic database interface for easy access would make it that much more useful. h/t to Jeffrey Tucker and the good folks at the Chant Cafe. This entry was posted in Chant on January 4, 2012 by Derek A. Olsen. This entry was posted in Anglican, Chant on July 19, 2011 by Derek A. Olsen. This session was amazing. I don’t have learning to appreciate fully everything that he said, but it has taken my understanding of late medieval liturgy up a level. (That’s not to say that you had to have a lot of prior learning to get anything out of it, just that he covered the whole spectrum. A shotgun blast of erudition!) I received a strong sense of how intellectual my knowledge of liturgy in this period is; I know books and books about books. What I don’t know nearly as well are the spaces in which the liturgies were conducted, the timing of the various parts and how both of these overlapped. Using the plans of Hereford Cathedral, Dr. Harper identified the three principal worship spaces within a late medieval cathedral. To the east is the Lady Chapel. In this area, a separately funded body of people are attending to the various services for Our Lady. Thus, there was daily a Matins, Lauds, Vespers, and Compline of the BVM, the Lady Mass, and, after Compline, the Antiphon/Anthem ceremony when choral arrangements of the Antiphons (Alma Mater Redemptoris, Salve Regina, etc.) would be sung. To the west of the Choir is the Nave or the parish church. You don’t see it in the 1950’s plans I inked to, but there was a stone pulpitum (essentially a big stone rood screen that you could get on top of—readings would be done from its top) that separated the Choir from the Nave. The Nave was the parochial space. The parish priest led masses, baptisms, weddings, funerals, and the Friday Jesus Mass in this space. However—note the aisle in the plan… On Sundays and Holydays processions that went forth from both the Choir and the Lady Chapel would travel around this space as the various services overlapped and inter-related. And it’s this inter-relation of space that must be considered to understand the full impact of sound and action in late medieval liturgy. There could literally be three different services going on at the same time—on in each of the three main spaces—and variously interacting with one another sonically if not physically. Indeed, there are surviving complaints from canons that the noise from the parish masses was interfering with their choir services. The organ would only play on Sundays and Holydays and, I believe, supported what was going on in the Choir. Hearing this piece of information made me realize that I have to reconsider the old Lent and Advent restrictions on organ playing—these never originally applied to parish settings, as far as I can tell, and chiefly impacted the Choir only! Rochester Cathedral (note the photo of the in-place pulpitum with the pipe ranks atop it and the railing where the reader would stand to read into the Choir but be seen and heard in the Nave) which has its Lady Chapel in the South Transept gives us a great opportunity to look at exactly how worship would have been late out in the period after Henry VIII’s break with Rome but before the institution of the Book of Common Prayer. This is English Sarum in its heyday. The reason why it’s such a terrific case is because Rochester had been staffed by a Benedictine priory. With the dissolution of the monasteries in 1540, it was re-founded as a secular cathedral by letters patent in June of 1541. Bishop Nicholas Heath drew up a set of injunctions in 1543 and statues in 1544 to regulate the life and worship of the new cathedral structure. Said: It’s on the chart but isn’t explicitly described. Clearly the minimum necessary here is a priest and a server. From the chart it’s clear that the Choristers and Master of Choristers are the main body for the Lady Chapel and the Priests & Clerks inhabit the Choir on Workdays. The Choristers are used for the Jesus Mass in the parish church on Fridays. On Holydays, the Full Choir and the Grammar School come together for big blowout events. In the Offices, the main areas for polyphony were the final Respond of Matins and the Magnificat (not the Benedictus, note). Compline was sung separately from Vespers and tended to be more formal (more formal than what I’m not sure—my notes don’t say: possible answers could be “than Vespers” or “than continental sources”). As a side note, note that music composed for the Lady Chapel is small-space music—it wasn’t intended to fill the whole space of the cathedral because it didn’t have to. Dr. Harper then displayed a fascinating chart that I didn’t have anywhere near time to copy down. It displayed the correspondence between liturgical “height” of a feast and the number of voices liturgical music (usually Masses) for the feast contained. It was a very clear distribution of kalendrical importance expressed through song. Christmas received pieces for 8 voices on one end of the spectrum; All Saints, and Feasts of Confessors and Martyrs received 5 at the other. One of his main points in the discussion of music on the eve of the Reformation is how much of it survived. Organs narrowly missed being banned by one vote (in Parliament, I believe) and Elizabeth saved the choirs. As we consider late Medieval liturgy/music and the transition into the early Anglican experiment, the retention of music must be kept in mind. The second part of Dr. Harper’s presentation was watching a video of a reconstruction of a Sarum service for the reconciliation of penitents. He asked us when we watched it to be aware of its effect on us from a few different angles. First, what does it mean to participate in a liturgy in a language we don’t understand but of which we know the general gist? Second, what is the lived impact of certain uses that seem boring on the page—like the prolonged recitation of the penitential psalms in plainsong—but may be more powerful in the experience? The service was done at St Teilo’s, a church which is part of a Welsh museum, and which the Harpers (John’s wife is also a formidable scholar of medieval music and liturgy) and other scholars are using to learn more about the lived experience of medieval liturgy. Here’s a pdf of a paper on how liturgists might learn from it and some pointers on how a Sarum Mass might be done in this particular church. Here’s at least a portion of the service we watched uploaded to YouTube. Jeremy Davies, precentor at Salisbury is serving as the priest, Dr. Harper is the second server. This entry was posted in Chant, Church History, Liturgy, Medieval Stuff, Sarum on January 24, 2011 by Derek A. Olsen. Thanks to the generosity of Father and the congregation, I’ve been honored to serve as sub-deacon at the Church of the Advent; last Sunday was my subdiaconal debut which went rather well. We use an adapted form of Fortescue’s ceremonial for those interested; I may put up my own notes on our practice if there’s interest. One of the major tasks of the sub-deacon is the proclamation of the Epistle. Following the best historical practice, it is sung recto tono or just simply read on most days. There is, however, an Epistle tone which is used on the highest feast days. The Epistle tone uses intonations for the metrum (pausing point), full stop, and questions as well as a unique concluding tone. As a result, I’ve been working on pointing the Epistles; last week it was the Pentecost reading, this week the Holy Trinity. It’s not a completely straight-forward process so I thought I’d share some of what I’m learning. 1. The presence of the metrum requires interpretive choices. That is, it marks a pause in the main thought of the sentence from which you continue to the end. Now I’ve noticed that readers in many churches have trouble proclaiming Paul well—and that’s entirely understandable. Even in translation, Paul’s writing style is unfamiliar to modern Americans. He uses long sentences with quite a number of clauses. And not all of these clauses are created equal, either. Some are parenthetical; some are additional; some are central.The trick is to proclaim them in such a way that the differences can be discerned by those listening. When chanting the reading, my base rule is that the metrum doesn’t just go on any ol’ comma or semi-colon that presents itself; rather, a metrum only belongs at the conclusion of a central or substantive clause. For parenthetical or additional clauses, I just put a holding punctus on the reciting tone at the conclusion. 2. My first port of call was the very helpful Sung Reading Tutorial and the accompanying audio files from the good folks at CMAA posted at MusicaSacra. Unfortunately, at the present time the link to the printed tutorial is broken. The audio, however, contains almost word-for-word what is in the tutorial. 3. …And found it in on the website of the (Roman) International Commission on English in the Liturgy. They have a document called “Music for the English Language Roman Missal” which gave some very helpful examples. This entry was posted in Anglican, Chant, Liturgy on May 27, 2010 by Derek A. Olsen.